Nurse Business Ideas: A Way to Leave the Bedside? As nurses we tend to be creative people. And what better way to use that creativity than to come up with nurse business ideas! In fact, I would imagine that this part of starting an online business is easy. The ideas flow fast and fluidly… maybe even come at as so fast that they can be overwhelming. Once you consider nurse business ideas, you then need to know what to DO with them. Because the second part of creative ideas and making them come to life means that you’re going to need to take some action! Domains, Hosting, and All Things Online! Yes, this stuff and all of the terminology can become confusing. This is why I HIGHLY encourage you to watch the video interview with Christy Hendricks below. In fact, even as a business owner myself, I found that Christy’s simple and practical way to explain domains, hosting, and online software was the FIRST TIME I clearly understood what someone was talking about!! 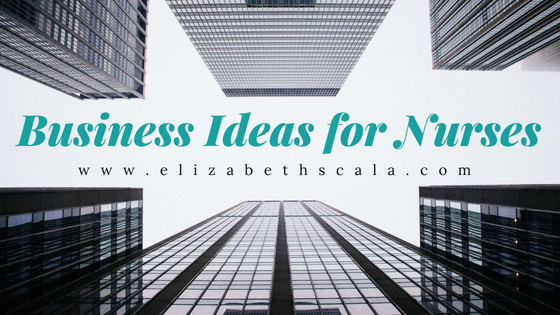 Nurse business ideas are things that can come naturally. Actually taking those ideas and putting them into action in a way that makes sense- not so much. Another truth. And something that trips up a lot of nurses as they start out growing a business on the side. If you do not charge, collect, and actually begin to make some money… then, you really are not in business at all. You are in a hobby. And that is OK. If a hobby is all that you want and need in the stage that you are at. However, if you are looking for a non-clinical nursing job or a way to leave bedside nursing- then, let’s face fact with fact. You need to replace that nursing salary. And your business is going to have to create the revenue to do so. These are just some of the many options that you have as a nurse with a business idea! If you’ve been thinking about the next shift in your nursing career– here’s your chance to make it happen! Take the first step and explore the various nurse business ideas. Tell her I sent you and enjoy this next chapter in your nursing career. Excellent post. Checked out Change of Shift and I really like Christy’s approach. Only thing I would ask is, is there a transcript of the video? Thanks for the feedback! So glad that you enjoyed the content. While there is not a transcript at this time, you may want to check out the audio portion that goes along with this. You can download the audio and then keep it to replay on your devices. Here is the link to that audio: https://elizabethscala.com/maketheshift8/. Enjoy!